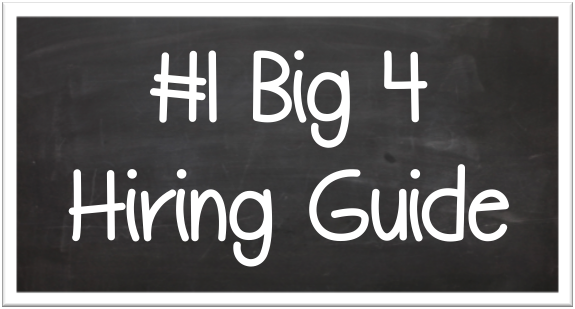 Interview — Big 4 Guru - Get Hired By Big 4 Accounting Firms! It is impossible to overstate the importance of interviewing. Your career with the Big 4 accounting firms can disappear because of one wrong answer, or one simple mistake. If your interviewing skills aren't flawless you can almost guarantee that this dream of yours is over. While this may sound harsh, it is a reality of the Big 4 hiring process. The Big 4 accounting firms interview thousands and thousands of candidates each year. Only the best lead to job and internship offers. In this package I will meet with you for 1-1.5 hours via telephone and ask you the same questions you will be asked in an interview with the Big 4 accounting firms. Then, I will give you feedback on your responses and help you improve them for any campus interview or Office Visit. If you are interested in working with the Big 4 Guru to perfect your interviewing skills, please send an e-mail to thebig4guru@gmail.com with 'Interview Help' in the subject or fill out the form below.